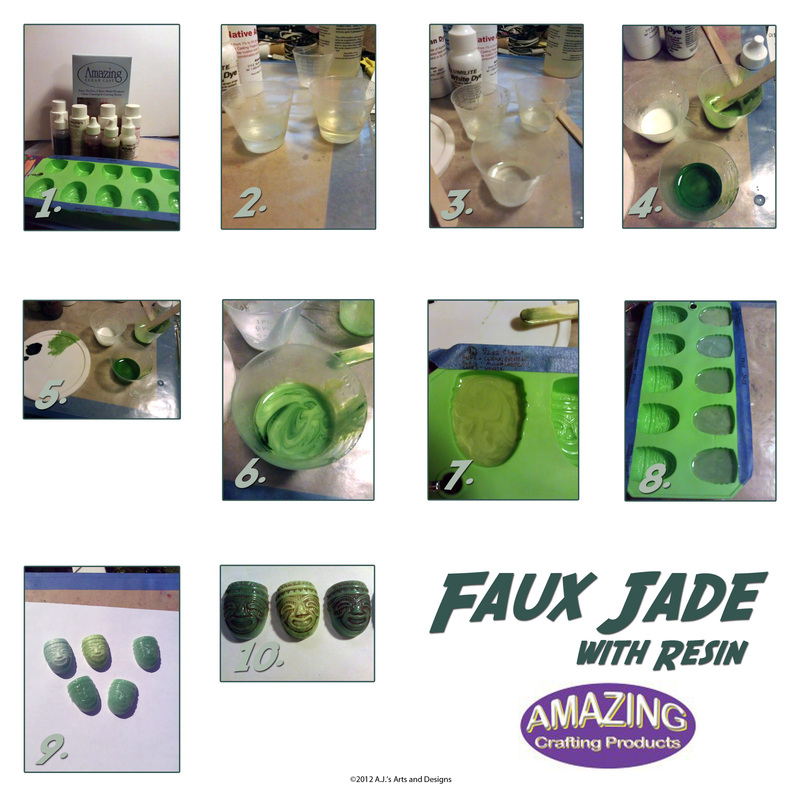 Faux Jade – Amazing Crafting Products Design Team | Who Are You Calling Crafty? I love our local library because of all the amazing How-To books you can find. The book I found is called “The Art of Resin Jewelry” by Sherri Haab, let me just state I need to add this book to my vast how-to collection. The faux Jade technique was taken from the book and it worked amazingly. The box was a wooden box that I painted to look like Jade. Use the code AMP20 at check out, and get 20% off of your order!! Offer expires – Sept 30, 2012. 3. Pour half the mixture into another cup. Taking one of the cups pour half into another cup. You will have one cup with 1/4oz and 2 cups with 1/8oz of resin. 4. The cup with the 1/4oz (the most resin) add green transparent dye. Mix throughly. 5. In one of the 1/8oz cups mix only white dye. Mix throughly. On a palette mix a green dye and white dye together to create a milky green. Add a drop or two to the remaining uncolored resin. 6. Pour milky resin and white resin into the transparent resin. Fold over a couple of times – you do not want to over mix, you want the swirls. 7. Pour into mold. Take a toothpick and slowly swirl together, note you do have to almost touch the bottom to create the desired look. Go slow or you will get bubbles. 8. Allow to resin to cure for 24-48 hours. 10. Add Burnt Umber paint to create the desired Faux look. Once you have the faux resin embellishment you can add it to anything. 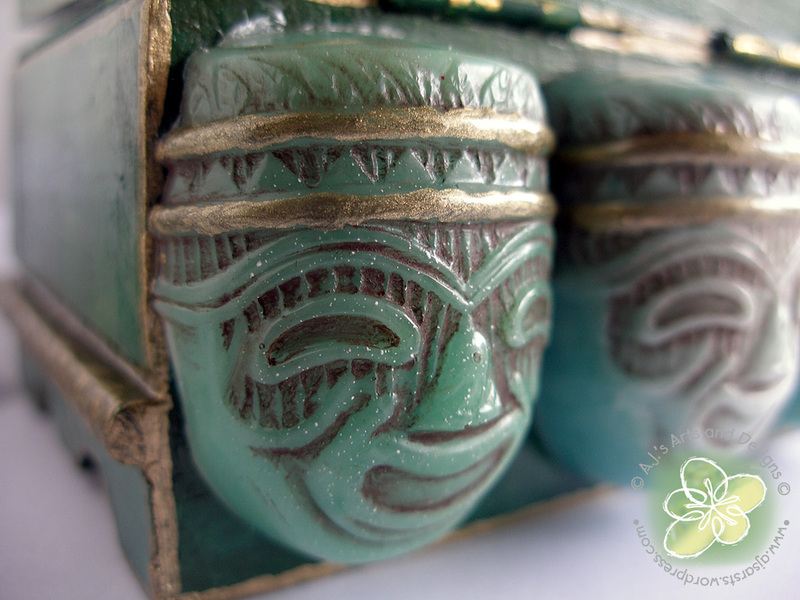 I choose to paint a faux Jade on a wooden box and add my embellishments to it. The gold trim was painted with a mixture of Alumilite Metallic Powder and 3D Crystal Lacquer. To see how I painted the box check out this post here! 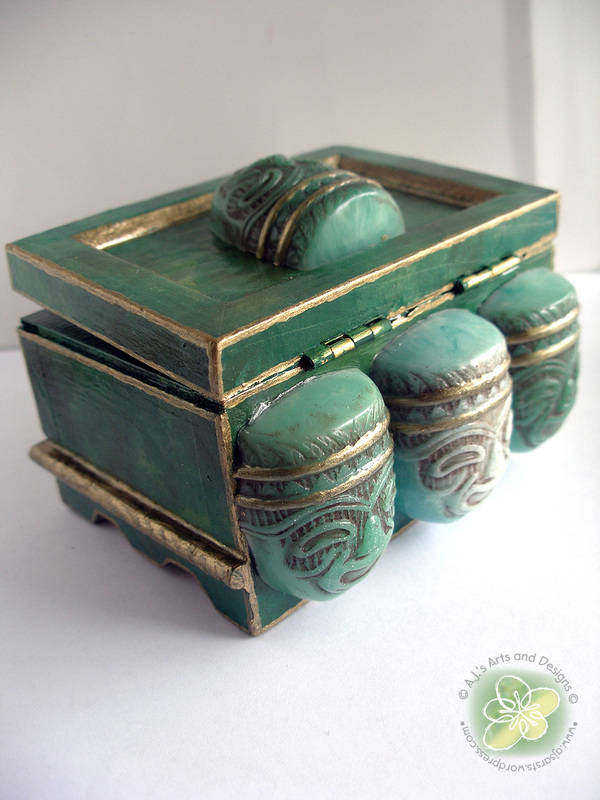 Pingback: How to Paint Faux Jade on a Wooden Box « Who Are You Calling Crafty?